Ok, I usually try to avoid writing about how weird Japan can be. Let's face it, it's been done. Books, movies, tv-- we've all scene the "Japan as weird" meme played out in the media. In fact, I think that 99% of all the stories written about Japan for westerners fall into two prescribed categories. 1. Japan is a weird place. Look at those crazy Japanese. 2. Japan is the land of the samurai, madame butterfly and zen aesthetics. I call this the "Temples and Tea Ceremony" meme. The reality is that there are some beautiful things about this country. And there are some pretty odd things-- and then there is a whole lot of other stuff between those two extremes. Having said that, this is just to weird to not share. 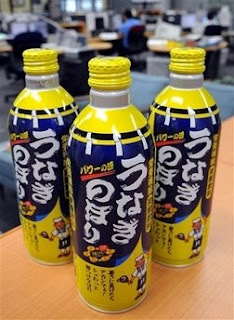 This summer to beat the heat, the Japanese are drinking a brand new canned beverage, made of eels. Yes, you did read that correctly, eels-- the long snake like fish. Tasty grilled but not something I would want to drink. Forget cola, lemonade or beer – Japanese people sweltering in the summer heat now have a new canned drink to quench their thirst – made out of eels. The fishy drink Unagi Nobori – which translates as "Surging Eel" – contains eel extract and vitamins found in the fish. The fizzy yellow liquid is believed to be the first mass-produced drink of its kind made in the country. Yum, eel extract. Hey honey, let's crack open a Surging Eel-- Cheers! UPDATE: Even more Strange-beverage-ness here.